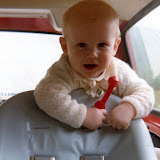 Have been foolish/generous enough to upload a folder of old pics of me that dad scanned… Why not comment and let us know which is your favourite? you’re so cute!! (with the possible exception of that blue hued one with the over sized glasses and the inflatable club).. now where’s the movember update?! I forgot to mention which one is my fav!Now although the one of you in the car at 10 months with the red phone is so very classic you and the one of you and your upset cousin in the cot sends me into a giggling frenzy every time I look at it – it is the pic of you at the table at 3 years old eating with the green beanie pulled way down that I love the most (this one made it from my pictures folder to my desktop background! )Look at you! Definitely the one of you in your speedo’s. What a body!